Precisely because anesthesia care has become so safe in terms of the reduction of major intraoperative anesthesia accidents, very few anesthesia practitioners today have any first-hand experience dealing in real time with a major anesthesia adverse event. While from an overall anesthesia patient safety statistical perspective, this fact is highly desirable, it also functionally represents a new danger. There is absence of experience, training, or even thought about what to do in the extremely unlikely, but yet still possible, event of coming face-to-face with an intraoperative anesthesia catastrophe. This deficit might prevent definitive action that can help the specific patient in a particular incident and patients in general who can benefit by lessons learned from that adverse incident. Application of the principles outlined in what has come to be known as the Adverse Event Protocol that was first published in The Journal of Clinical Anesthesia in 1993, but is just as relevant today, will overcome the lack of knowledge and experience. This plan of action will help minimize damage to the patient (and also to the involved practitioners) as well as promote understanding and learning that will help prevent recurrence or repetition of the adverse event. Prior to the mid-late 1980s the prototypical intraoperative anesthesia catastrophe was an unrecognized accidental esophageal intubation during the induction of general anesthesia with muscle relaxation. In such a case, the first indication of trouble often was an expanding stomach and transient tachycardia and hypertension from the sympathetic response to hypoxemia and hypercarbia followed soon by the surgeon making an incision and commenting with distress: Hey! The blood looks really dark down here! Ventricular ectopy leading quickly to fibrillation ensued, creating an immediate life-threatening crisis. The necessity was to get help, make the initial diagnosis by recognizing the cause of the problem, replace the endotracheal tube correctly in the trachea, successfully resuscitate the patient, verify that the incident had ended, institute care to minimize hypoxemic damage, and administratively manage the situation, including with investigation and teaching to reduce the probability of it happening again to another patient. Other examples also usually involving some type of failure of ventilation (such as from an unrecognized breathing circuit disconnection) or even a disruption of the oxygen supply are possible, but the point is clear regarding the need to organize the response to such a major event. By the end of the 1980s the nature of intraoperative anesthesia accidents changed with the creation and universal application of the strategies of intraoperative anesthesia safety monitoring. Specifically the change of behavior and mindset from intermittent to genuinely continuous patient and anesthesia delivery system monitoring coupled with the use of then-new electronic monitors as extensions of the anesthesia provider’s senses allowed extremely sensitive real-time monitoring of patient oxygenation and ventilation. This resulted in much earlier warning of the potentially dangerous mishaps (that continue to occur still today) that previously would have evolved to patient injury. The information in the warning, in turn, directed and facilitated diagnosis and correction of the problems well before the onset of injury. As a result, the frequency and severity of intraoperative patient-injury accidents decreased dramatically. Thus, a significant component of the previously traditional training and experience of anesthesia practitioners was functionally eliminated. While overt unrecognized simple failures of ventilation are much less likely, they can still occur. Also, other, more modern, intraoperative accidents may be more complex and more subtle. Human error theory suggests analogies to other types of major accidents: airliner or train crashes and nuclear plant or electric power grid disasters. These usually involve 2 or more abnormalities or variances in conditions or procedures coincident in time that cause unusual interaction and results, making the operator (or anesthesia practitioner) face an unfamiliar situation. A listing of actual or potential situations is not possible in this setting, but they do happenvery rarely, but they do. Today, applying population statistics, a new practitioner could expect to be involved in a patient-injury accident once in an average career. This means, by definition, that the practitioner will have no direct experience in managing such a situation. The Adverse Event Protocol is specifically intended to fill that gap and arm every anesthesia practitioner with a detailed, carefully thought out plan to respond to a patient-injury intraoperative accident. Laminated copies of the printed protocol were attached to anesthesia machines in some operating rooms (ORs) in the 1990s. Today, a great many OR rooms and virtually all OR suites have immediate Internet access. The original Adverse Event Protocol is in the APSF website: www.apsf.org, Clinical Safety Tools under Resource Center at the top of any page on the site. When the urgent overhead page in an OR suite comes, ANESTHESIA STAT! to OR X, almost always several people respond, usually more than can physically get to the head of the involved patient at one time. One of the helpers later to arrive profitably could either be assigned or take their own initiative to go immediately to an on-line computer and print or even simply read out loud the protocol from the APSF site. Get help and mobilize according to the protocol see above for access to the Adverse Event Protocol on the Internet. The primary caregiver(s) should continue patient care. Except in the very unusual circumstance that the anesthesia provider becomes ill or disabled or is so shocked by the realization of the accident that s/he cannot function, s/he should devote full attention to direct clinical care rather than to the necessary organizational and administrative considerations. Assumes overall direction and control of the event. Organizes help and assigns tasks in the OR. Verifies incident has ended and there is no immediate recurrence (e.g. correct intubation and ventilation in the prototype example, continued availability of tank oxygen after a central oxygen supply failure, etc.). Involves consultants and advisors as indicated, including specifically the chief/chair of anesthesiology or appropriate designee, and any others who may help with care or recovery, such as neurologists, cardiologists, etc. Alter nothing (no cleaning, no disassembly, no repair); if it appears likely or even possible that an equipment failure (anesthesia machine ventilator, bubble detector on a rapid infuser, or whatever) contributed to an accident, it may be indicated to conduct an inspection/testing session involving the real-time participation of representatives of the involved practitioners, the equipment manufacturers, the equipment maintenance personnel, facility administration, and involved insurance companies/attorneys. Discard nothing; sometimes the solution to a mystery can later be discovered in unexpected tiny details, such as an empty or missing or extra medication vial that suggests an accidental wrong drug administration may have caused the accident. Lock away all of the above (this may be difficult in a busy facility; be reasonable; for example, if it is accepted by all involved that there was an unrecognized esophageal intubation involving apparent human error, it would be possible to release the OR and its equipment for use the next day and dispose of the trash). Contact the care facility’s administrator and risk manager (possibly also the practitioner’s insurance company and attorney if indicated). Verify that the elements of this protocol have been applied. Maintain ongoing communications with all involved caregivers and patient representatives, coordinating and facilitating as much integration as possible. Pursue the accident investigation in conjunction with involved quality assurance and risk management systems and personnel; eventually prepare a report as indicated, particularly focusing on lessons learned and actions needed to help prevent similar accidents in the future; participate in any peer-review activities conducted regarding the event. File reports as indicated, such as with the FDA and ECRI if it appears that a medical device or medication hazard was involved in the cause of the accident. Put strictly objective narrative entries in the medical record and incident report (but these can include background details on the involved thinking, such as, for example, the indication for invasive monitoring based on symptoms and signs of congestive heart failure). (Possibly) make additional detailed (including subjective impressions or value judgments) personal notes for later usecreated specifically while sitting with an attorney (personal or from the practitioner’s insurance carrier) who keeps them as attorney-client work product. Try to review formal reports submitted by the institution to the authorities (state department of health/licensing body or the National Practitioner Data Bank) both in order to know what they contain and also add your observations or commentary if indicated. Talk to surgeons and consultants about care; make suggestions as indicated. Be visible, supportive, and not defensive with all involved. Communicate as much as possible (see # 6. above). Note that the lack of communication from caregivers and facilities involved in the immediate and longer-term aftermath of major anesthesia accidents was poignantly cited with great distress and even pain from the patient/family survivors perspective. This was graphically detailed in the previous issue (Eichhorn, JH. Patient perspectives personalize patient safety. 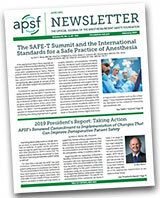 APSF Newsletter Winter 2005-06;20:61-66) in a report of the first-ever public presentation and discussion by anesthesia accident survivors and is further expanded in a companion article in this issue of the Newsletter. Application of the protocol principles will also help address this critical issue. There are numerous examples of the successful application of the principles outlined in the Adverse Event Protocol with beneficial results for all involved, but these are beyond the scope of this particular article. Of course, there are many situations in which the protocol is not indicated, such as an intraoperative patient death that was not anticipated but that clearly was caused by the patient’s underlying condition. The application of the protocol is particularly intended for sudden patient-injury accidents in the OR, especially when the anesthesia care may be involved in the causation. Further, a completely unexplained sudden cardiac arrest may well be revealed the next morning at autopsy to have been the result of an unavoidable massive pulmonary embolus, but with that fact being unknown at the time, activation of the protocol during the arrest is certainly appropriate. The learning potential from any application of this protocol is significant, much in the same manner as Emergency Department trauma teams apply evaluation and treatment protocols and later review their efficacy. In all such circumstances (OR, ED, general care floor, etc.) the immediate and long-term intention of the protocol is to prevent and/or mitigate injury to the specific subject patient and all subsequent patients in similar situations. Reprinted from: Cooper JB, Cullen DJ, Eichhorn JH, Philip JH, Holzman RS. Administrative guidelines for response to an adverse anesthesia event. J Clin Anesth 1993; 5:79-84. Objectives: To limit patient injury from a specific adverse event associated with anesthesia and to ensure that the causes of the events are identified so that a recurrence can be prevented. 1. The primary anesthetist/anesthesiologist should concentrate on continuing patient care. The primary anesthetist/anesthesiologist should notify a physician responsible for supervision of anesthesia activities in the relevant patient care area, e.g., Anesthesia Clinical Director, Anesthesia OR Administrator, Team Leader, as soon as possible (at least before the anesthetist transfers direct responsibility for that patient). The person so contacted will direct the process of immediate prevention of recurrence (if necessary), events documentation and continued investigation or will delegate responsibility to someone other than the primary anesthetist or anesthesiologist. The individual performing these tasks is designated as the incident supervisor. Rationale: Information vital to reconstructing events may be accidentally discarded. The highest priority for the primary caregivers must be the care of the patient, so responsibility for administrative and investigate activities must be assigned to others. Typically, an anesthesiologist supervising a primary anesthetist/anesthesiologist should not be the incident supervisor. However, out of normal working hours, a primary or supervising anesthesiologist may choose to act as incident supervisor and may exercise discretion in calling for assistance or advice. 2. Anesthesia equipment or supplies associated with the case, whether thought to be materially involved or not, should be sequestered before subsequent use. Nothing must be altered or discarded. The primary anesthetist/anesthesiologist or incident supervisor shall immediately contact the hospital individual responsible for management of anesthesia equipment and supplies (equipment supervisor). The equipment supervisor or his designee shall supervise the impoundment of involved supplies and equipment (including the anesthesia machine) in consultation with the hospital Risk Manager. A preliminary decision to continue use of urgently needed equipment may be made, following a safety inspection, at the discretion of the incident supervisor in consultation with the hospital Risk Manager. Rationale: Equipment or supplies involved in the event may be accidentally altered or discarded, preventing determination of cause. 3. The incident supervisor or attending anesthesiologist should contact the hospital Risk Manager immediately following the anesthetic for additional administrative support. Rationale: Individual caregivers will rarely be experienced in dealing with an adverse occurrence. The Risk Manager can advise on the ways to communicate information to the patient or to the patient’s family in a way that is forthright and comforting, but which does not unintentionally alarm, misinform, or render judgment. 4. The primary anesthetist/anesthesiologist and other individuals involved must document relevant information about the incident. 5. The primary anesthetist/anesthesiologist, after discussion with the incident supervisor, must write on the patient’s medical record relevant information about what happened and what actions were taken. Do not erase or obscure information on the record. If a correction is necessary, lightly cross out the original; initial and date changes. Additions to and explanations of notations on the record can be made, for example, to explain issues where professional judgment was involved. 6. The primary anesthetist/anesthesiologist must complete and file an incident report as soon as practical. 8. When writing about the events. State only the facts as you know them. Do not make judgments about causality or responsibility. Do not use judgmental terms or phrases. 9. Give the highest priority to continued involvement in follow-up care of the patient. 1. Consult early and frequently with the surgeon. 2. Immediately call upon other consultants who may help improve long term care or recovery. 1. notify the individuals involved of their responsibilities as defined in this document. 2. be responsible for assuring that procedures are followed to the extent necessary, reasonable and possible. 3. maintain communication with those who are providing continuing anesthesia care, providing guidance and advice as needed. 4. ensure that information regarding the adverse event is communicated through the proper channels to the departmental quality assurance program. 2. The need to maintain equipment sequestration shall be determined by the incident follow-up supervisor and the individual responsible for managing anesthesia technology. 1. If it is unlikely the equipment was related to the event, the equipment can be returned to service after routine inspection. 1. Store the equipment in a secure location. Label it DO NOT DISTURB. 2. Document its physical condition and notable features as received and record its identification, e.g., serial number. 3. Do not alter or inspect the equipment in any way that could affect further investigation. 4. Conduct a thorough inspection of the equipment in the presence of the primary anesthetist/ anesthesiologist, the insurance carrier, hospital Risk Manager, equipment manufacturers or any of their designees. 3. If an equipment problem or failure is discovered or strongly suspected, the equipment supervisor, after consultation with the hospital Risk Manager, shall consider contacting the Food and Drug Administration (via the Device Experience Network @800-638-6725) and/or the Emergency Care Research Institute (ECRI) if it is believed necessary to warn other users. Alternatively, the manufacturer can communicate that information to the appropriate authorities, which may be required by law depending upon the circumstances. 4. Under the Safe Medical Devices Act, the hospital may be required to report the event to the manufacturer and FDA if a serious injury or death occurred. 5. Continue to verify and document medical care provided to the patient following the event. 14. Primary Anesthetist/Anesthesiologist: Concentrate on continuing care; notify Anesthesia OR Administrator (or attending first if resident or CRNA); Do NOT discard supplies or apparatus or tamper with equipment; document events in the patient’s record; Do NOT alter the record; stay involved with follow-up care; contact consultants as needed; submit a follow-up report; document continuing care in the patient’s record. 15. Incident supervisor, e.g., Anesthesia Clinical Director, OR Administrator, Team Leader: Advise primary anesthetist/anesthesiologist and other personnel involved; verify close contact with the surgeon and other consultants; contact the hospital Risk Manager; contact manager for anesthesia equipment or alternate. 16. Department Chairman or Clinical Director: Directly supervise or delegate responsibility for incident investigation. 17. Anesthesia equipment manager or alternate: Assure impounding of equipment, if necessary, and determine appropriate disposition of equipment; if pharmaceuticals or supplies were involved which may create hazard to other patients, contact pharmacy, materials management, nursing or other departments; supervise continuing investigation of equipment or supplied-related issues; contact FDA, ECRI or manufacturer if appropriate. 18. Follow-up Supervisor: Notify the individuals involved of their responsibilities as defined in this documents; be responsible for assuring that procedures are followed to the extent necessary, reasonable and possible; maintain communication with those who are providing continuing anesthesia care, providing guidance and advice as needed; ensure that information regarding the adverse event is communicated through the proper channels to the department quality assurance program. Accidents will likely continue [very rarely, it is hoped] despite our best efforts to prevent them. Being prepared to organize resources and responses to an accident may limit injury to the patient concerned and prevent injury to subsequent patients. Timely investigation and documentation may be critical to determine cause and to develop a prevention strategy. The opportunity to learn from an accident should not be wasted. [It is anticipated] that implementation of this protocol may help to meet these objectives. Dr. John Eichhorn, Professor of Anesthesiology at the University of Kentucky, founded the APSF Newsletter in 1985 and was its editor until 2002. He remains on the Editorial Board and serves as a senior consultant to the APSF Executive Committee.